Posted 02-04-2013 by Dale Bohman. Schoolfield Properties is recognized as one of the top Commercial Real Estate Firms in Central Florida. They were instrumental in securing sites for and bringing the now familiar WA-WA stores to our area! 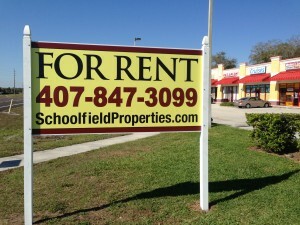 If you visit Kissimmee and the surrounding area you see many of their commercial real estate signs around. They have wanted to improve the look and cost effectiveness of their signs, and at the same time increase visibility. We had used vinyl sign frames for them before but they covered some of the sign face area. The maximum allowable area of a real estate sign is 32 Square Feet. The customer wanted more of the sign image to show in order to stand out and take advantage of every inch! Initially we tried printing 2 sign panels for a 4×4 sign, and screwing them front and back onto 4×4 posts with no frames and painted with crenellation accents. They achieved more of the goal, however when looked at the cost of 4’x8’ signs, the cost became prohibitive to print 2 panels that size for each sign. PIP Signworks’ HP FB500 UV Ink Flatbed Printer in action! however the downside would be that the back would have 3.5” on either side covered up. Schoolfield had an idea and asked if we could just cut grooves in the 4×4 posts and slide the signs in. I thought about it and told her that I thought we could do it with ¼” thick di-bond aluminum and that I would work on a solution. 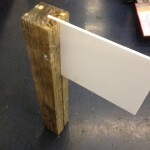 I went to work over a weekend and devised and built a channel guide for a router that would follow the length of the post and put a straight ¼” groove into the post, 1 ½ “ deep that we could slide the sign into, and then drill holes completely through the post and anchor the sign securely with. Before completing the new idea, we tested the groove idea…perfect! I did a small test piece with a piece of post I had and inserted a piece of ¼” PVC to test my theory. I sent a picture of the test piece to my customer and told her I thought we had and option and suggested that we do one complete sign, install it and see what they thought. It was agreed and we started the first sign. 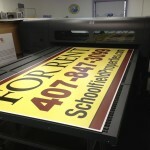 The sign was printed on our HP FB500 UV ink flatbed printer, printed both sides on the ¼” di-bond aluminum. We completed the sign and everything went as planned. Schoolfield picked up the sign and put it together. They liked to product and ordered several more to meet their needs. The cost savings of using 1 vs. 2 panels was significant and the sign was also more attractive as a result! At PIP Signworks, we believe in working with our customers to find the right solution for their need. We are not afraid to try new things and always want to make sure our customers are 100% satisfied with their solution!